Passionate about protecting the environment, Thomas Kean, who coined the phrase, “New Jersey and You: Perfect Together,” remains the most popular of all the New Jersey governors. In an effort to generate political cooperation among historically divided interest groups and politicians, Kean authored a book, The Politics of Inclusion in 1988. And he lived by his own words. Political adversaries and friends for over 40 years, Thomas Kean (Republican) and Brendan Byrne (Democrat) served consecutive double-terms as governor of New Jersey. In chronicled interviews known as the “Kean-Byrne Dialogue,” published in The Star-Ledger, the two debated major issues affecting New Jersey and the nation for over 23 years. Whether or not the two former governors agreed on a topic, their interactions were always civil, and based on mutual respect. 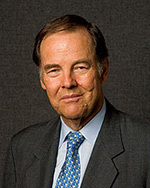 Come help us celebrate the many achievements of our 2018 Gala Honoree, Governor Thomas Kean, as he reflects upon his illustrious career, shares his views on environmental issues, and takes a few moments to pay tribute to Governor Byrne.